In our search for high quality, all natural, pasture-raised meat sourced from farms we can trust, Intentional Swine was born. Based in Asheville, NC, we work with a network of high integrity farms to source a variety of heritage breed beef, pork, poultry and more. We are not farmers, but rather specialize in whole-animal butchery and hand crafted charcuterie. Through our network of ethical farms, Intentional Swine intends to bridge the gap between customers and the small scale farm as we seek out the types of meat we believe in. Through our CSA program, we source whole animals from trusted farms and transform them into amazing butcher's cuts and prepared meats, utilizing the age-old practices of whole animal butchery and hand crafted charcuterie. The result? The Butcher's CSA. 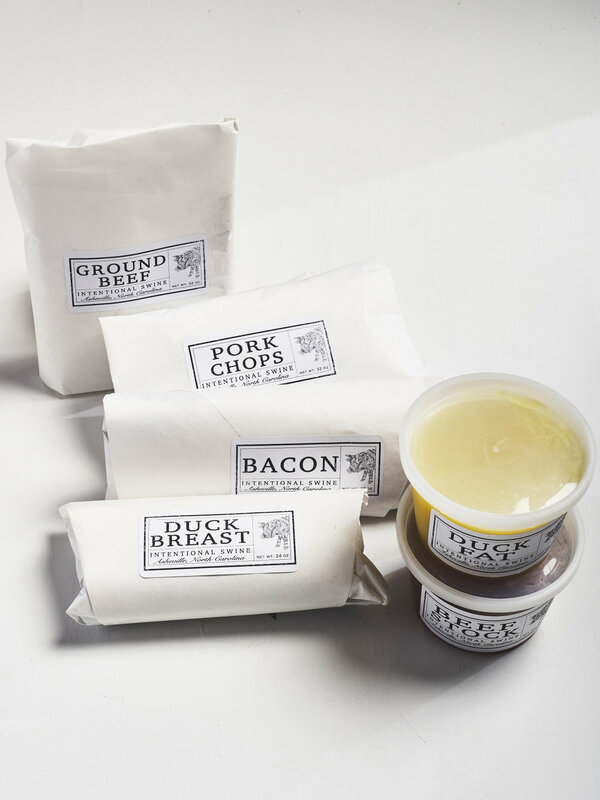 Each CSA is filled with a variety of nutritious, ethical meats and includes a selection of butcher's cuts and prepared products, all wrapped up in one convenient package. SEE WHAT'S IN THIS MONTH'S CSA! Shares are purchased in 3 month installments, with one pick-up per month. Pick-up location is on Wednesday's at All Souls Pizza, in the River Arts District of Asheville (175 Clingman Ave.) Once purchased, all you need to do is come on your designated pickup dates to collect your meat for the month. Shares will offer a variety of meats which would provide approximately 4 meals for a family of 4, each month. See shop for further details.